I have given pride and arrogance to riding men for eons. I have felt the sting of driving whips, lashes, spurs and quirts. I am gallant and exalted – I am stately – I am noble. I have felt the hand of kindness from the losers and the sinners. The world is but a player’s stage – my roles have numbered many. Under blue or under gray – I am the horse. 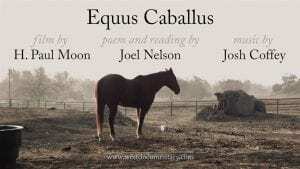 A reading by Joel Nelson of his poem “Equus Caballus” during the 29th National Cowboy Poetry Gathering in Elko, Nevada on February 1, 2013. Additional footage from the ranch of John Dofflemyer on December 20, 2013. Official Selections in the 2014 Visible Verse Film Festival, 2015 Trail Dance Film Festival, 2016 Film Festival at Little Washington, 2016 ZEBRA Poetry Film Festival, 2016 5th International Video Poetry Fest, and 2017 SINESTESIA Mostra Internacional de Videopoesia. Winner at the 2015 Rabbit Heart Poetry Film Festival and 2015 Equus Film Festival. Curated into “The Horse” exhibition at Nevada Museum of Art, looping March-July 2016, and “Horses of the American West” exhibition at Western Folklife Center, looping September 2016-May 2017. Camera by H. Paul Moon and Shang Ik Moon; music composed and performed by Josh Coffey, engineered and performed with Jacob Siener; editing by H. Paul Moon. This piece is from footage we filmed for a feature-length documentary work-in-progress. For more information, visit: westdocumentary.com. Joel Nelson is highly respected in the world of cowboy poetry and recitation. He has appeared in many major cowboy poetry festivals, including the National Cowboy Poetry Gathering and the Texas Cowboy Poetry Gathering, which he co-founded. A Vietnam veteran and former custom saddle maker, Nelson is an excellent horse trainer. His CD “The Breaker in the Pen” (2000) was nominated for a Grammy Award. Nelson was awarded a National Heritage Fellowship from the National Endowment for the Arts in 2009, and was also poet-in-residence at Rothbury, Northumberland, England. He lives and works with his wife on their 24,000-acre ranch outside Alpine, Texas, where they raise Corriente cattle. H. Paul Moon (zenviolence.com) is a filmmaker based in Washington, D.C.  His body of work includes documentaries, dance films, and experimental cinema, regularly featured at film festivals worldwide. He also worked as a small camera specialist for a Paramount feature film starring Will Ferrell and Mark Wahlberg, and as cinematographer for director Josephine Decker’s film in “collective:unconscious.”  His recent films include “Sitka” (sitkadoc.com) about the craftsmanship of Steinway pianos, and “Quartet for the End of Time” (quatuor.xyz) about Olivier Messiaen’s transcendent wartime composition. He has just completed a feature-length documentary about composer Samuel Barber (samuelbarberfilm.com), and is currently finishing “The West” (westdocumentary.com). Joel Nelson is highly respected in the world of cowboy poetry and recitation. He has appeared in many major cowboy poetry festivals, including the National Cowboy Poetry Gathering and the Texas Cowboy Poetry Gathering, which he co-founded. 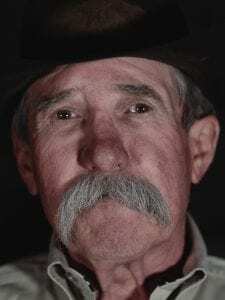 A Vietnam veteran and former custom saddle maker, Nelson is an excellent horse trainer. His CD "The Breaker in the Pen" (2000) was nominated for a Grammy Award. Nelson was awarded a National Heritage Fellowship from the National Endowment for the Arts in 2009, and was also poet-in-residence at Rothbury, Northumberland, England. He lives and works with his wife on their 24,000-acre ranch outside Alpine, Texas, where they raise Corriente cattle. A reading by Joel Nelson of his poem "Equus Caballus" during the 29th National Cowboy Poetry Gathering in Elko, Nevada on February 1, 2013. Additional footage from the ranch of John Dofflemyer on December 20, 2013. Official Selections in the 2014 Visible Verse Film Festival, 2015 Trail Dance Film Festival, 2016 Film Festival at Little Washington, 2016 ZEBRA Poetry Film Festival, and 2016 5th International Video Poetry Fest. Winner at the 2015 Rabbit Heart Poetry Film Festival and 2015 Equus Film Festival. Curated into "The Horse" exhibition at Nevada Museum of Art, looping March-July 2016, and "Horses of the American West" exhibition at Western Folklife Center, looping September 2016-May 2017.